For me, the good news today was that I wrote 4,700 words, I haven't done that in a while! The bad news, though, was that none of those words went into a blog post. That's okay, I decided, I did what writers do, namely write, but I still wondered what I was going to post about. 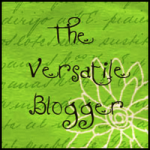 With these thoughts running around in my head like a gerbil on a wheel I opened my digital mailbox and found a note from Melanie Marttila over at Writerly Goodness breaking the good news that she had awarded me the Versatile Blogger Award. Looking at Melanie's email, it felt as though the universe had smiled on me. What a lovely thing to be given and what a marvelous topic for a blog post. I'm honored, thank you Melanie! a) Thank the person who gave you this award. That’s common courtesy. b) Include a link to their blog. That’s also common courtesy — if you can figure out how to do it. d) Nominate those 15 bloggers for the Versatile Blogger Award — you might include a link to this site. e) Finally, tell the person who nominated you 7 things about yourself. So, first, thank you Melanie! I'm honored that you thought of me when you were giving out the award. :-) I've put a link to Melanie's blog, Writerly Goodness, above, but I thought I'd include it here as well. Elizabeth writes the Memphis Barbeque series for Penguin/Berkley (as Riley Adams), the Southern Quilting mysteries (2012) for Penguin/NAL, and the Myrtle Clover series for Midnight Ink. She blogs daily at Mystery Writing is Murder, which was named by Writer’s Digest as one of the 101 Best Websites for Writers for 2010, 2011, and 2012. I am a mother of three with an English degree and an obsession with children's and YA literature. I edit children's books part-time for a small, independent publisher. I love teaching and wish I could do more of it. I have a love/hate relationship with writing and think I ought to do more of it. I write stories, most of which contain a fairy or two. On this blog I write about the things that matter to me. When I'm not making stuff up I also love taking photographs. All the photos here are my own. If you're still curious, find out more on my About page. - The Land of Deborah. Singer, songwriter, composer. Deborah isn't a writer, but she is definitely a fellow creative. Here's her YouTube channel [link]. I'm a sci-fi/fantasy author, freelancer, and movie critic, which as far as jobs go is among them. I enjoy kung fu, which I'm all right at, and my aquarium, which kills more fish than StarKist. I'm not too happy about that. His tagline says it all. Great writer, great advice. I'm going to have to split this post into two, it's getting so long! 7 today, 8 tomorrow. btw, I tried to avoid overlap with the links I gave out in a recent post, Great Writing Blogs, but Elizabeth's blog and books are just too good not to mention again! The VBA is one of the interesting off-shoots of Robert Lee Brewer's April Platform Challenge. Several of the MNINBers (for Robert's blog: My name is not Bob) have set up a community of practice with a Facebook page, LinkedIn group, a Goodreads group, and a PHP bulletin board (That's a lot of SoMe!). I received my nomination from one of the MNINB crowd and thought I'd branch out to nominate some of my favourites. Hi Melanie! Thanks for the background, and for mentioning Robert Lee Brewer's blog, I just went by there, lots of great reading. Branching out is always a good idea and the gesture was much appreciated. Cheers!